Mercedes-Benz has built a strong reputation in North America... and it needs to stay that way. Sporty or not, the various models in the portfolio are either very luxurious (think S-Class), impeccably designed (CLS-Class) or supremely comfortable (GLK-Class). Company executives are awfully proud of this image, and they're quite aware that such refinement needs to trickle down to smaller products in the lineup, even entry-level cars. It might appear small at first glance but, upon further review, it compares favorably to top rivals. With that in mind, Mercedes-Benz finally decided a couple of years ago to add the compact B-Class wagon to the list of Canadian offerings. The car seems so small, actually, that representatives in the U.S. said "Thanks, but no thanks", arguing that traditional Mercedes buyers would never purchase a vehicle like this. Now, after a few years on the market, the B-Class appears to fare pretty well. It may not be one of the industry's true success stories, but it sure holds its ground in the premium compact segment. 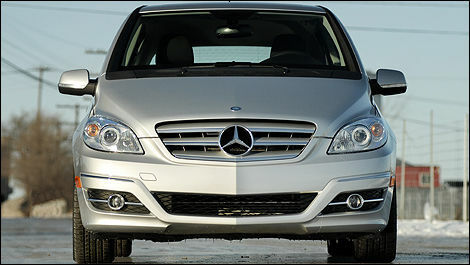 Whether you're looking at the base model or the Turbo (as tested), the B-Class sports a fairly basic shape. As mentioned, it might appear small at first glance but, upon further review, it compares favorably to top rivals. It's just as long as the Audi A3 yet taller, and roughly the same size as the Dodge Caliber yet with a much longer wheelbase. Styling, meanwhile, is not really innovative. The lines are classic in typical Mercedes-Benz fashion, starting with the three-pointed star in the middle of the front grille. The new model year brought a few cosmetic changes but not a radical transformation. 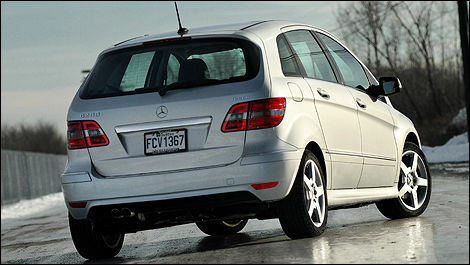 So, overall, the 2009 B-Class looks pretty much like its good old self. The most notable revisions were applied to said grille as well as the bumpers and taillights. The interior also boasts a series of upgrades for 2009, particularly the seats which are now trimmed in higher-grade fabric. Every other modification is relatively negligible; after all, the cockpit was already a wonderful interpretation of the Mercedes-Benz character, with quality materials and flawless fit and finish. The new model year brought a few cosmetic changes but not a radical transformation. General Motors of Canada has just issued a recall similar to Toyota's. However, instead of nearly 240,000 vehicles, only 16,724 units are affected.